with 31 games to go." Roy Hodgson has total confidence that he can guide Liverpool up the Barclays Premier League table over the coming months. The boss - voted Manager of the Year by his peers at the League Managers' Association in May - was asked by journalists following our 2-1 defeat to Blackpool whether he had any doubts over his ability to turn things around at Anfield. He replied: "I don't think you go from being as feted as I was in May to suddenly losing any abilities I have three months later. It's a question that's going to get asked but it shouldn't really be asked by people who've been in football for a long time, because they know that in football you have good moments and bad moments. "At the end of May I was having fantastic moments and at the end of September I'm having bad moments, but I don't think that after 35 years of coaching I've suddenly lost the abilities that have served me so well." Meanwhile, Hodgson is not ruling out dipping into the transfer market in January if he feels signings are necessary to improve our league position. He explained: "We've got to trust in the players because until January we can't do anything about that. "We changed formation two or three times (against Blackpool), there were several attempts to change things around. We had Dirk Kuyt playing as a front player, then we moved him wide and moved Joe Cole in. We moved Meireles into the centre and brought on another wide player. "We did what we could with the players we have available at the moment, but we are a little bit short of out-and-out front players at the moment, and of course we lost one of the most important ones near the start of the game." Roy Hodgson is struggling to keep his head above water at Liverpool - and TEAMtalk thinks he faces a battle for his supporters' affections. With one word the Liverpool faithful cast their vote on the new regime of Roy Hodgson - and it was not favourable. As the Reds slumped to defeat at home to Premier League newcomers Blackpool, the sound rolled down off the Kop: "Dalglish, Dalglish, Dalglish". They were referring to their beloved 'King Kenny', sitting in the main stand. The man who offered to come to the club's aid in their hour of need but was put firmly and squarely in his place by chairman Martin Broughton and chief executive Christian Purslow. Dalglish is a legend at Liverpool as he was not only voted the club's greatest player but he was also the man to lead them to the last of their 18th league titles in 1990. When Rafael Benitez left in the summer and with the club in turmoil with the on-going sale by Tom Hicks and George Gillett, the 59-year-old offered to step into the breach and hold the fort while everything calmed down. He was told his services as manager were not required and the board instead turned to Hodgson. One school of thought was that Dalglish had been out of the game for too long but, judging by Liverpool's results in their opening seven league matches - which have brought just six points - it is difficult to see how he could have done much worse. His appointment would certainly have gone a long way to healing the growing chasm between the board and the fans and also probably in uniting an increasingly disparate-looking squad. Hodgson has yet to have his name chanted at Anfield and, in the current circumstances, with the club 18th in the table, it is unlikely to happen any time soon. He has had to deal with a number of player dealings, which have not necessarily meant like-for-like replacements, is trying to instil a new playing style and does not yet know his best team. But despite his wide-ranging coaching CV, which has taken him from Halmstad in Sweden to Inter Milan, the 63-year-old does not seem to have grasped what it means to be Liverpool manager. The fans want a man in charge whose success they can admire and who, in turn, they can adore. That he arrived in July having only won trophies in Sweden and Denmark meant the supporters needed some convincing. He was not a promotion from Anfield's now-defunct Boot Room, nor did he have Spanish league and UEFA Cup titles behind him like Benitez. A Europa League final defeat with Fulham two months previously cut no ice and what Hodgson had to do was assume the mantle of Liverpool manager and do it with an air of authority, while also appearing sensitive to the fans' needs. He has so far failed in both, and him telling supporters protesting against owners Tom Hicks and George Gillett that they were not helping him or the team was poor judgement. What he must do now is turn things around quickly, and he has no better opportunity than in the Merseyside derby at Goodison Park when the Premier League resumes. But in order to achieve that he has to get the team playing somewhere close to their best, and judging by performances so far that is a large leap forward. A mid-table finish and losing a Europa League final may be enough for Fulham. At Liverpool it is classed as abject failure. Talk of Hodgson's departure is far too premature and he will have the time to turn things around. However, looming over his shoulder is the possibility that, when the club is eventually sold, if results have not improved significantly he may find time runs out for him very quickly. Even after defeat to Blackpool at Anfield, even after reviewing a league table which ranks Liverpool the 18th best team in the league, even after seeing another atrocious performance, even after hearing the chants for Dalglish, nobody even tried to ask Roy Hodgson whether he was considering bringing his 14-game tenure on Merseyside to an abrupt halt. Everyone knew the answer, anyway. Hodgson would not dream of committing an act tantamount to cowardice. A man of short fuse, he would treat such an enquiry with disdain. Nobody at the club has even whispered the suggestion that he may not be long for this job, that his reign in the Boot Room will not last beyond the autumn. Even the Merseyside derby on Oct 17, a game which looms with rare dread in Liverpudlian minds, is unlikely to change that. Even if Hodgson was to take his Premier League record at Anfield to played eight, won one, even if Liverpool trudged back from Goodison Park still marooned in the bottom three – and, on current performances, there is every reason to believe they still will – he would not find himself under any pressure from his employers, and they would not expect to find him wracked with self-doubt. Instead, he will be given more time aplenty, the excuse used no doubt being the legacy of failure he inherited, the poor resources at his disposal, the paucity of quality in Liverpool’s squad, the time required to right such wrongs. Such an idea has reverberated around the red half of Merseyside for years, ever since Hodgson’s predecessor Rafael Benitez failed to keep pace with Chelsea and Manchester United. The only problem is that it was bunk then and it is bunk now. Liverpool’s squad is full of internationals. The side that fell to Blackpool started with 11 on the pitch, and four more on the bench. The likes of Daniel Agger, Fabio Aurelio and Ryan Babel were not even accounted for, while those who have not yet received international recognition are youngsters of promise, rather than journeymen of regret. True, international honours are no guarantee of quality. Few would suggest that Sotirios Kyrgiakos, Lucas, Brad Jones and Milan Jovanovic are the sort of players of which title dreams are made. This is, of course, quite correct. But they are still all Premier League class – not Champions League class, not title class, but Premier League class – and they should all be capable of partaking in a win against Blackpool, despite Ian Holloway’s side’s impressive performance. The debate last year, the reason for Benitez’s dismissal, was that he had failed to build a squad capable of challenging for the Premier League title. This was eminently fair. What he had built, though, was a squad not vastly inferior to those at Tottenham, or Manchester City, or Aston Villa, and better than those at Sunderland, Birmingham and Everton. Liverpool had, and have, the look of a team that should be challenging for Europe. After all, the majority of the side is the same as that which finished second just 18 months ago. What the debate never used to be was whether this Liverpool squad was good enough to stay in the Premier League. Or, if that is a little knee-jerk, whether this squad was good enough to finish in the top 10. Of course it is. It boasts the best goalkeeper in England, if not Europe, Pepe Reina, one of the totems of the last decade, in Steven Gerrard, and, when fit, arguably the finest striker in the world, Fernando Torres. That it is failing is not testament to a dearth of quality. The players are not performing to the best of their abilities. That is the fault of the manager, and no-one else. Liverpool forward Dirk Kuyt has apologised to the club's fans after the 2-1 defeat to Blackpool at Anfield yesterday. Ian Holloway's Premier League newcomers dominated the first half and were more than worth their two-goal half-time lead earned by Charlie Adam and Luke Varney. Sotirios Kyrgiakos's header pulled one back early in the second half and the Greek defender was denied an injury-time equaliser by goalkeeper Matt Gilks but a draw would have merely papered over the cracks of another poor performance. Liverpool's former championship-winning captain Alan Hansen described the players' display as a "disgrace" and Kuyt admitted it was one of his worst times in a Liverpool shirt. "It was really, really disappointing," said the Dutchman, who was by no means the worst player on the pitch. "It's probably one of the hardest defeats I've had to take since I've been here and we're sorry for the fans. "The first thing we have got to do is make sure we start winning games again and then we can begin to take things from there." Liverpool must now spend the next fortnight rooted in the bottom three because of the international break before they return to action in the Merseyside derby at Goodison Park. Manager Roy Hodgson admits he and the squad have plenty of work to do to put things right and Kuyt is confident the players will turn things around. "It is still early days for the manager and we have to keep working but one thing I do know is that we will come back stronger for this experience," he added. "It's frustrating that we have got the international break now because we will have this result hanging over us and everyone in the dressing room wants to put it behind us as quickly as possible. "We know this result has not helped but we just have to try to focus on the spirit we showed in the second half. "We have got to make sure we show it in the next game." Liverpool's start to the current campaign is statistically their worst since their ill-fated 1953-54 season which saw the club relegated into the Second Division. In their first nine league games back in that season, the team won only once. That was a 3-1 triumph over Portsmouth on the opening day. But things really went downhill at a rapid pace following that victory. Liverpool, who were managed by Don Welsh, lost five of the next eight encounters. These included a 4-0 reverse at Newcastle United and a 5-1 thumping at home in the very next match against Preston North End. The only games in which they picked up points in that dismal run were home draws against Manchester United, Newcastle United and Wolves. Alongside legend Billy Liddell, the team that season also boasted the likes of Laurie Hughes, Alan A’Court, Ronnie Moran, Geoff Twentyman, Bob Paisley, Ray Lambert and Louis Bimpson. After that appalling opening run, Liverpool earned a 4-0 win over Burnley to bring some relief to the Anfield faithful. But the rot set in again in the next match, a 6-0 hiding at Charlton Athletic and the writing was on the wall. They eventually finished bottom of the table with just 28 points from 42 matches. Eight seasons in the Second Division wilderness followed until promotion was secured in 1962. The South Yorkshire club were thrashed 6-0 at home to Chelsea and heavy defeats at Manchester United (7-0) and Arsenal (5-0) had followed, but Ashley Ward decided the contest in the 35th minute. Graham Taylor’s Watford had just been promoted and were very much the underdogs when the fixture list sent them to Anfield in only their third game, but the Hornets won with Tommy Mooney’s14th minute goal. Just over a decade after their previous visit to Anfield, Barnsley made it back-to-back wins at Liverpool with a famous upset in the fifth round of the FA Cup, Brian Howard netting the late winner for the visitors. Having slipped out of the title race and been dumped out of the UEFA Champions League, the FA Cup was one of their few remaining hopes of silverware but Shane Long’s headed winner completed a turnaround. League Two Northampton became the latest shock victors at Anfield as Liverpool suffered a penalty shoot-out Carling Cup defeat. And so a three-year crisis off the field has now been joined by a three-month crisis on it. 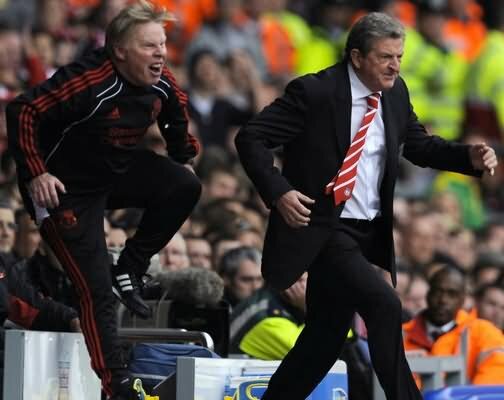 Roy Hodgson has been in the post as manager of Liverpool for less than 100 days. Yet already there are diehard supporters on the Kop who have clearly lost faith in him, as well as some who had little or none to begin with. On Saturday a viral text message in the name of Reds supporter Graham Agg, who has long since established a special relationship with supporters of Borussia Monchoengladbach, Liverpool’s EuropeanŠ foes in two friendly finals of the 70s, was circulated. It said: "The Liverpool FC hierarchy need to accept they have made a mistake of monumental proportions and dismiss Hodgson forthwith. “Kenny Dalglish has the aura, charisma, knowledge and knows the club inside out. And above all he commands respect and is a winner. “He should be immediately appointed the next manager of LFC. “Hodgson is out of his depth and talks as though we are Fulham and not the European giant we truly are. Whatever you think of those acerbic sentiments – premature, grossly unfair, or even spot on – you can’t today accuse Agg of relying on hindsight for his forthright view. Because by Sunday evening, as Blackpool’s players danced on the Anfield turf, it was clear there were a fair few people inside the place who agreed with him. Of course, a chunk of the fans’ current frustration is rooted in the whole ownership crisis and all they have been through with it. Yesterday once again saw diehard Reds supporters marching upon Anfield before the match to demand once and for all the end to the Tom Hicks and George Gillett era. A good number of them too, were urging that current managing director Christian Purslow should follow him out of the door. Make no mistake, these are awful, unprecedented and uncharacteristic times for Liverpool and their supporters, who are increasingly divided by factionalism and fury over how things got to this - and how they might be sorted. But by 5pm last night, it was clear the anger from the Kop had far more to do with football, rather than finance or felons in the boardroom. Because what Liverpool and their manager are serving up to the supporters right now is worse than shoddy. It is disjointed, dispirited and heartless. Well it was in the first half at least and by the time the players found a bit of rhythm and fight, it was too late to recover. And it all means Liverpool – who two seasons ago finished second in the Premier League amid the same ownership crisis, don’t forget – are now in the relegation zone. They have made their worst start to a season for 57 years, a season which duly saw them relegated. Is it really this serious? Can it really be that bad? Not so, insisted a bewildered, rather than beaten-looking Liverpool manager in his post match press conference. Talk of relegation is, as he rightly states, beyond credulity. But he admitted defeat to Blackpool – yes Blackpool, already thumped 6-0 by Arsenal and 4-0 by Chelsea this season – had made for a nightmare day as they recorded their first victory over Liverpool for 43 years. It is a victory that follows hot on the heels of Liverpool being dumped out of the Carling Cup by Northampton, their worst defeat in 51 years. And too of them clawing back a point at home to Sunderland the previous week. None of it makes good reading because Liverpool’s football does not make good viewing right now. They say football fans aren’t stupid and the corollary to that must be that Liverpool supporters are A Star pupils of the game, such has been their education over decades of still unparalleled success. Not only that, the supporters on the Kop have always been renowned as being the most loyal in the game, too. Some people often argue to a fault. As much as anything that’s because Liverpool supporters, perhaps more than any other set of fans, love to love their managers; not deride them. Certainly not when they’ve only just begun. There may have ultimately been howls of derision aimed at Graeme Souness in his final days, but when Gerard Houllier left at the end of the 2003/4 season, there had been no chants for his head. Just a quiet sense of ‘please take him out via the back door’ spilling from the Kop. The club’s mutual parting with Rafa Benitez earlier this year troubled, and still troubles a fair few Kopites. But even after he lost 20 games last season and as the pressure grew upon him, there were no mass demands inside the stadium for him to go. Yesterday, there were none directed specifically at Hodgson. But even more hurtfully and humiliating for him perhaps, many on the Kop – and others in the stadium – loudly chanted the name of one Kenny Dalglish. It may have been a verdict on the changing face of football and for Anfield a shock to the system to witness. But to a large degree it was a verdict on the way Liverpool are shaping up – or rather not – right now. Hodgson faces innumerable difficulties managing this club right now, which must not be forgotten. He himself is trying to manage expectations. But they are inevitably high at a club like Liverpool and the harsh truth is that he is simply not getting anything like the best of out of the players at his disposal. This gentleman scholar of the game clearly knows it. It is puzzling him and hurting him, it is plain to see, too. He is clearly a manager who, for all the many positives and achievements on his long cv, embarked on the biggest challenge – and opportunity – of his managerial career when he walked into Melwood on July 1. Less than 100 days on, it’s an even bigger challenge today than it was then. For all their off field troubles, for all the relatively recent departures of players like Alonso and Mascherano which have diminished the capabilities of this team, they are surely better than this. Hodgson has to prove it – and should be as open-minded as he likes and as ruthless as is necessary – to do so. Because in these modern and deeply troubled times at Anfield, there is clearly no honeymoon period. Never mind the jeers at half-time and full-time, the desperate performance from his players or a dire defeat that plunges Liverpool into the relegation mire. It is instead a single word from a hugely disgruntled Kop that could ultimately have the greater ramifications for beleaguered Anfield manager Roy Hodgson. There, in a spontaneous outburst, a section of Liverpool’s disillusioned, frustrated supporters passed verdict on the new manager yesterday. Losing games and losing face is one thing. But losing the fans, especially just 94 days into a tumultuous reign, has become a very real possibility for Hodgson after a poor start to the Premier League campaign plumbed new depths with home defeat to promoted Blackpool. Sat in the directors’ box, a stony-faced Kenny Dalglish, the popular choice to replace Rafael Benitez in the summer, remained unmoved at the call from the supporters, but Hodgson must surely have been shuffling uneasily in the dugout. The 63-year-old launched a passionate defence of his managerial methods over the weekend over claims he is out of his depth. But just look at the statistics. With only six points from seven games, this is the least impressive start to an Anfield managerial career since George Patterson in 1928 and Liverpool’s worst opening to a top-flight season since 1953-54. They were relegated that season, and this morning find themselves back in the drop zone after a weekend round of games for the first time since September 19 1964. And there can be few complaints on the evidence thus far. To think exactly 12 months ago today Liverpool headed to Stamford Bridge looking for the three points that would have sent them top of the Premier League table. Right now, many fans would settle for top half come May. The club’s American owners rightly take the flak for an awful lot of what has gone wrong at Anfield, but Tom Hicks and George Gillett don’t pinpoint the transfer targets, pick the team and choose the tactics. That buck rests with Hodgson and, as against FC Utrecht on Thursday, his team, while not lacking in effort, played for lengthy periods without cohesion, creativity or imagination. Maybe that shouldn’t be a surprise. After all, Joe Cole, Raul Meireles and Jamie Carragher – starting a game at left-back for the first time since March 2004 – were all out of position while both the returning Steven Gerrard and Dirk Kuyt have become accustomed to different roles in the 4-2-3-1 formation that served them well in recent years but has been jettisoned in favour of a more orthodox 4-4-2. Yes, the sight of Fernando Torres prompting new injury fears by hobbling off with a groin problem 10 minutes into the game was an untimely reminder fortune hasn’t exactly favoured Hodgson. But this was a Blackpool team that had already been thumped at both Arsenal and Chelsea this season, defeats that prompted manager Ian Holloway to intimate his team would go on the offensive at Anfield. It was a wise decision, and the Seasiders were full value for their first victory against Liverpool since 1967, with Charlie Adam’s penalty and Luke Varney’s well-taken strike ample reward for an enterprising first-half display. Hodgson’s men roused themselves briefly after the interval and while Sotirios Kyrgiakos pulled a goal back, they appeared as likely to concede a third as grab an undeserved equaliser to hastily cover the cracks. The international break means Liverpool will now have two weeks to brood both over their predicament and a Goodison derby against similarly struggling Everton that Hodgson simply dare not lose. The warning signs had been there for Liverpool as early as the second minute when Pepe Reina was required to beat out a powerfully-hit 20-yard free-kick by Adam. DJ Campbell should then have done better when firing an inviting Neal Eardley cross over at the far post, while Skrtel made a fine block to prevent Varney from capitalising on space inside the area. So it was no shock when Blackpool went ahead on the half-hour after Varney exposed Glen Johnson’s defensive frailties with a straightforward run into the box that teased a rash challenge from the Liverpool right-back for a stonewall spot-kick. Reina went the right way and got his hands to Adam’s penalty, but the power took the ball into the goal. The home threat until then was minimal, their best opening coming when Kyrgiakos, easily Liverpool’s best player on his first Premier League appearance of the season, headed on a Gerrard corner and Eardley cleared off the line before Cole could pounce at the far post. Going behind at least encouraged more urgency from Hodgson’s men, substitute David Ngog, Kuyt and Cole all forcing routine saves from Blackpool goalkeeper Matthew Gilks. But the visitors finished the half the stronger, Reina saving from Campbell and Stephen Crainey before, on the stroke of half-time, Gary Taylor-Fletcher’s fine pass beat Liverpool’s offside trap and Varney smashed home for Blackpool’s second. Liverpool showed far more initiative after the break – to be fair, not too difficult a task – and, after Ngog sent an inviting header wide from Kuyt’s cross, they pulled a goal back on 53 minutes when Kyrgiakos rose above Blackpool centre-back Ian Evatt to head Gerrard’s free-kick delivery in off the underside of the crossbar. Cole then spurned a great chance to equalise when, released by Carragher inside the area, he slipped the ball beyond both keeper Gilks and the far post. It was a pivotal moment, as Liverpool’s belief slowly began to drain and Blackpool’s returned. Kuyt headed a diagonal Gerrard ball at Gilks late on before the keeper saved brilliantly to deny Kyrgiakos a second in injury time, but an equaliser would have been unjust. Blackpool were given a standing ovation by all four sides of the ground at the final whistle while Liverpool left the field to the sound of boos ringing in their ears. But it is that one chant from the Kop that continued to resonate long after the dismayed home support trudged back to their homes. Roy Hodgson knows well enough that the buck will always stop with the manager, but the truth of Liverpool’s defeat against Blackpool is that the 11 players who started the game should be embarrassed. They were wearing red shirts at Anfield and produced a totally unacceptable performance in a defeat that left Liverpool in the relegation zone. It was an embarrassment. Forget about the history and tradition of the club. Pride also comes into it, but if the pride isn’t there among the players, then there is not a lot of hope for the club. Results are the manager’s responsibility and Roy knows that and that is why he is now being subjected to criticism from the supporters. The owners have also left the club in a mess, so that is another big problem. But it is up to the players to show anybody and everybody that they have the passion to turn this around and that must start when they play Everton in their next game following the international break. Let’s not forget, Liverpool have a group of players who played in the latter stages of the World Cup this summer. Some even played in the final. So when they are facing Blackpool at home, needing to win to escape the bottom three, you would expect them to come out and roll Ian Holloway’s team over and score five or six goals. That is not because Blackpool have just been promoted and were not fancied to win. It is simply because Liverpool were at home, they needed a victory and they should have taken Blackpool apart. It didn’t happen. Even at 2-1 down, you expected them to surge forward and get something from the game, but Blackpool continued to be the better side. It is little wonder that the fans’ patience finally snapped following the game. After three to four years of unbelievable support, and last year in particular when they watched some absolute drivel away from home, it reached breaking point with this defeat. They have seen enough sub-standard football, enough rubbish. At some point, it becomes too much and that is why the supporters were so angry after Sunday’s game. Despite the disharmony on the Kop, Liverpool are not going to change a manager after seven games. They are not going to change him after another 10 games either. It is not what Liverpool do and the people who are running the club know how it operates and how it has traditionally done things. The only way that a change will be made is if Liverpool are in the relegation zone at Christmas, but that will not happen. Roy does need to change things, though. He must make Liverpool more adventurous, especially at Anfield, and he has to inject some pace into his defence. He cannot be judged on the players he signed yet because it is too early, but you have to question whether some of those he inherited are good enough. I don’t enjoy singling out individual players, but I am surprised that Roy is playing Sotirios Kyrgiakos because he just does not have the pace. David Ngog is a million miles from being an adequate replacement for Fernando Torres, Dirk Kuyt always falls short when asked to step up to the plate and Milan Jovanovic is struggling. Torres doesn’t seem to be getting any fitter and he is now injured again and will probably be out for two to three weeks. It all keeps coming back to Steven Gerrard, but one-man teams tend not to win much and Liverpool cannot keep relying on him to rescue them all of the time. Now is the time for everybody at Anfield to come together and throw their support behind the team, even if that means forgetting about the protests against the owners. It is vital that that issue gets resolved sooner rather than later because the club needs investment and a new stadium, but we can talk about that until the cows come home. Liverpool’s managers have had money to spend, but the club’s record in the transfer market in recent seasons, barring the odd exception, has been abysmal. Liverpool have bought players who cost more than the £8 million that Tottenham paid for Rafael van der Vaart, so it can’t all be the owners’ fault. What about the scouts? The team and the results are all that matter, but there is no defence for anybody at Anfield, be it the owners, the manager or the players. To get out of this mess, everybody has to pull together and that has to start happening straight away. Blackpool boss Ian Holloway was in dreamland after seeing his side shock Liverpool 2-1 at Anfield. The top flight new boys piled the misery on the struggling Reds on Sunday, leaving their illustrious opponents languishing in the relegation zone. Charlie Adam fired Blackpool ahead from the penalty spot on 29 minutes and Luke Varney added a second right on the stroke of half-time. Sotiris Kyrgiakos pulled a goal back for the home side early in the second half, but Blackpool defended stoutly to record a memorable victory. Holloway admitted afterwards that he could barely believe what was happening to his side, with the Seasiders enjoying a fairytale existence during their debut season in the Premier League. "It is one of the dreams I've had for years," he said, after seeing his side applauded from the field by the home support. "When the fans were singing You'll Never Walk Alone - it's my dad's favourite song but he's no longer with me - I was singing myself and it was a bit emotional. "This is not far off the home of football - these supporters have seen some of the best football over the years and in my era as a player there was no better team in the world. "The boys made me so proud and for that set of supporters to clap us off that is all I wanted - that was what my dream was last night. "This is a fantastic moment for Blackpool." Holloway felt his side were good value for their victory, but admitted that the sight of Fernando Torres hobbling from the field early on helped to inspire his players. "To see the best striker in the world limp off after a few minutes, I can't tell you what that did for us," he added. "His mere presence is awesome so to see him come off played into our hands and helped us." Liverpool boss Roy Hodgson admitted his side's form was unacceptable as they slumped to a home defeat by Blackpool. The Reds are third from bottom of the Premier League and asked if six points from seven games was unacceptable, Hodgson replied: "Yes of course it is. "This is Liverpool. We are a big club and big team and none of us would accept it is a correct total," he said. "We can't do anything about that now but we certainly have to work very hard to do better in the future." Liverpool went behind to a Charlie Adam penalty and a Luke Varney strike and, despite a second half rally which saw Sotirios Kyrgiakos pull one back for the Reds, Blackpool held on for a famous victory. "In the first half we were correctly punished for a lacklustre display," admitted Hodgson. "We had the ball as much as them but did not do anything with it anywhere near enough to satisfy my, the club's or the players' demands. "We conceded two goals on counter-attacks but in the second half we came out and tried to turn matters around but could only get one goal. "Their great result is our nightmare result. It is a very bad day and there is nothing I can say. "At the moment things look bleak and really bad and it is difficult for me to put a bright face upon it." Liverpool's disastrous start to the season, their worst since the Premier League began, has also seen them eliminated from the Carling Cup at home by League Two Northampton. However, Hodgson stated that his players' failure to perform to their potential was of greater concern than the team's lowly league position. "There are 31 games left but when you are in the relegation zone you are in a relegation battle," he added. "But I really don't think my concerns are with relegation, my concerns are that we are not playing to our full potential. "I am not going to think too much about relegation with 31 games to go." Liverpool were not helped with striker Fernando Torres having to go off after 10 minutes against Blackpool because of an injury. "It is a groin strain, I don't know how severe," said Hodgson. "It came as a surprise to us, we had no awareness there were any problems in the groin area. "I don't know if it was something which happened during the course of the game." Blackpool piled the misery on struggling Liverpool with a famous 2-1 win at Anfield to leave the Reds rooted in the bottom three. Charlie Adam fired Blackpool in front from the penalty spot after Glen Johnson had brought down Luke Varney inside the box. Varney added a second on the stroke of half-time to leave Liverpool leaving the field at the break to a chorus of boos. Sotirios Kyrgiakos pulled a goal back on 53 mintes when he headed home Steven Gerrard's free-kick, but despite some late pressure Blackpool held on for a deserved three points. To add to Liverpool's problems Fernando Torres lasted less than ten minutes after appearing to injure his groin. Manager Roy Hodgson has spent his three-month tenure at the club insisting there would be a transitional period but their current position is shameful for a club of Liverpool's stature. There is little he can say to excuse this result, yet another in a string of disappointing displays which have been characterised more by poor performances than anything else. Blackpool, to their credit, were well worth their win on their first-half performance but it should not be forgotten that they are a side who went to Arsenal and Chelsea and were beaten 6-0 and 4-0. Prior to kick-off they had conceded more away goals than any of their rivals (10) but that record was not something which was exploited at all by their hosts. They were not helped by the 10th-minute loss of striker Torres to a suspected groin injury, but even then they should still have at least dominated possession. But they did not get chance as Blackpool attacked from the off and Adam's second-minute free-kick had Jose Reina batting the ball away. Torres barely had time to flash a cross into the six-yard box where Joe Cole deflected it wide before he was replace by David Ngog. Blackpool were enjoying far more of the play than they could have expected to at Anfield and DJ Campbell went close at the far post from Neal Eardley's teasing right-wing cross. When Steven Gerrard gave the ball away in his own half it was only Martin Skrtel's sliding challenge which denied Varney's shot but the pressure eventually told in the 29th minute. Right-back Glen Johnson, in particular, has had a dreadful start to the season and it got worse when he brought down Varney, allowing Adam to fire home the penalty despite Reina getting a hand on it. Liverpool's response was half-hearted with Kyrgiakos, Ngog, Johnson, Dirk Kuyt and Raul Meireles all failing to test goalkeeper Matt Gilks with chances. Seconds before the interval the Seasiders stunned their hosts when Gary Taylor-Fletcher flicked a ball into the penalty area and Varney ran on to fire past Reina. Two minutes into the second half Ngog should have buried his header from Kuyt's cross when unmarked only to miss the target but Kyrgiakos showed him how it should be done in the 43rd minute, powering home Gerrard's quickly-taken free-kick. The tide had turned as now Liverpool were enjoying all the possession, even if it had taken them nearly an hour to establish such a position. Meireles had three attempts in quick succession, although only the first forced Gilks into a save, before Cole was put through by Carragher only to see his delicate dink beat the goalkeeper but roll past the far post. A positive substitution removed defensive midfielder Christian Poulsen for forward Milan Jovanovic, with Meireles dropped back into his favoured central position. As quickly as Liverpool had gained their attacking momentum it seemed to desert them just when they needed it most in the final 15 minutes. Kuyt's header at the far post from Gerrard's cross was the closest they came but it lacked the power or direction to beat Gilks. The Reds have now gone five matches in all competitions without a win - no wonder the Kop chanted the name of Kenny Dalglish, who was overlooked for the manager's job in the summer. Hodgson has some serious thinking to do while the majority of his squad are away with their national teams.